“Nothing is impossible with God,” said Gabriel. Overshadowed by the Holy Spirit. It’s like these grapes on the vine. They were just basking in the sun, drinking in nourishment from the vine and producing fruit. They weren’t striving like I do sometimes to get a project accomplished. They just rested, and fruit was a natural progression of abiding in the vine. They’re now separated from the vine. If I don’t eat them first, they’ll shrivel up. They’ll no longer be juicy. I’ll end up throwing them away. Just as the grape is the result of abiding in the vine, the fruit of the Spirit is the result of us abiding in Jesus. It comes naturally. Our job is to rest in Jesus and allow Him to equip us for the works He has ordained from before the beginning of the world for us to accomplish. I don’t know about you, but I had a life plan all worked out after high school. That got dashed soon. I got sick, dropped out of college, married, and traipsed all over the world for 22 years, while Keith was in the Air Force. God had a different plan for me. At first I fought His plan. But His plan was much more wonderful and difficult than I could have ever imagined. God had a plan for a teenager in Nazareth. Completely different than she had imagined. A girl of 14 to 16 years old. A girl who was poor. A virgin. Engaged. A girl who was intimate with the Word of God. In Luke 1, Gabriel visits Mary. Whoa! Can you imagine an angel showing up next to you and saying that? What would you think? Well, Mary was afraid. What would your reaction be? A girl betrothed—that’s as binding as marriage, a contract—pregnant! Sure young girls dreamed of becoming the mother of the Messiah. It was prophesied in Isaiah 7:14. But,what would people say? What would Joseph say? Mary knew her God and submitted her body, her reputation, her betrothal, and her destiny to God for His plans. Praise much like Hannah responded when God promised her a son, Samuel. This girl knew her Scriptures. She was ready for God to act. Mary stayed with Elizabeth for about 3 months. Then she returned to Nazareth. She must have been showing by then. Can you imagine the snickering that went on? The penalty for fornication was death by stoning. Joseph thought about quietly divorcing her. You know the story, Gabriel visited Joseph and told him that Mary was going to be the mother of the Son of God. So he did not divorce her. It came close to the time of Mary giving birth. Wait! Micah 5:2 tells us that the Messiah would be born in Bethlehem—70 miles south of Nazareth. God used Herod to send out a decree that all should return to their native cities. Imagine riding on a donkey just days away from giving birth. 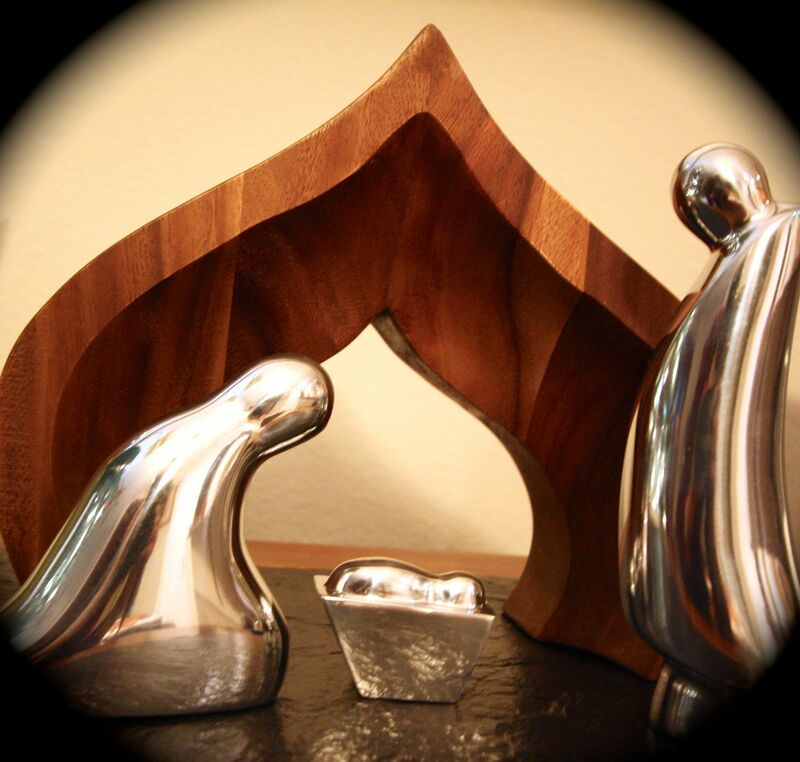 When Mary and Joseph got to Bethlehem, there was no room for them, so they stayed in a stable; it could have been a cave. Alone with the cattle and sheep. Alone, she gave birth to Jesus. Angels announced His birth to shepherds (some think it was the shepherds keeping watch over the temple sheep—the sheep to be sacrificed for sin as Jesus would be sacrificed someday). The shepherds visited Jesus and his parents that night. Oh no! More troubles? Hasn’t Mary already had enough? Then Herod tried to find and kill Jesus, so Joseph swept up Mary and Jesus and fled to Egypt. When all was clear, they returned to Nazareth. Mary and Joseph were faithful Jews. They went to Jerusalem every year to celebrate Passover. When Jesus was 12, he stayed behind in the temple to talk with the rabbis. The custom was that the women and children would begin the journey before the men. Mary set out for Nazareth with family and friends—she thought Jesus was with Joseph. When the men caught up with the women, Jesus wasn’t with them. They searched among other family members and friends. No Jesus. It took them 3 days to find Jesus. He was in the temple. Where did Jesus get that? Could Mary and Joseph have told him that he was the Son of God? I believe so. They took him back to Nazareth, and he was a good boy, obeying his parents and growing in wisdom and stature. And Mary treasured all these things in her heart. The next time we see Mary, she’s at a wedding in Cana with Jesus and his disciples. Wedding celebrations lasted seven days, and the host was supposed to feed the guests, and of course, wine was a part of the festivities. To the mortification of the host, the wine ran out. Mary came to Jesus and told him. He responded that his time was not yet. She turned to the servants and told them to do whatever he told them. How did she know that he would create wine? Could it be that she knew her Son so intimately, that she knew what He would do? His ministry took him away from Mary. I’m sure she heard of His miracles and teachings. I know it was painful to hear of the disdain of those who talked about Jesus being born of fornication, as the Pharisees brought it up to Jesus. At one point, Jesus returned to Nazareth, and Mary and his brothers went to take him home because they thought he had lost his senses. This was no easy life that God had blessed Mary with. We see Mary standing at the foot of the cross with John. The other disciples had disappeared. Can you imagine your son beaten beyond recognition as a man? This man was her son. This man was her Messiah! Jesus is the promised Savior of Israel! He’s been beaten, cut open with the whips, and now He’s hanging on the cross. His legs are getting tired as He pushes up to take a breath. Come down from that cross! Cry with Mary as they take Jesus down from the cross. The promised Messiah … dead. Michelangelo had an idea what Mary must have felt like when he created the Pieta. From a mother’s eyes, I see a woman who had experienced everything miraculous about this Son, her Savior, her Lord … from His birth to the temple, from water to wine, from feeding the 5,000 to walking on water, from raising the dead to touching the lepers, restoring sight to the blind and song to the deaf. This was the Messiah—the One who was going to save Israel. All her hope, all her love, all her dreams, all her treasures. Can you imagine her prayers? I know what mine would have been. God, I went through all of the snickering, giving birth in a MANGER with the animals—ALONE. We fled to Egypt, I worried about Jesus losing His senses, I wondered why the Sanhedrin challenged Jesus, I agonized during the scourging. Now THIS! Where’s the hope You promised? That’s what I remember when I stand before the Pieta. Pieta means “pity.” Every time I stand before the Pieta, I cry, sometimes sobbing. One day I heard another woman sobbing behind me. I pulled her to the front and told her “He did this for you and for me.” We cried together while people snapped their photos and walked on. Three days after they laid Jesus in the tomb, Mary’s hope was restored. Her Lord had risen. 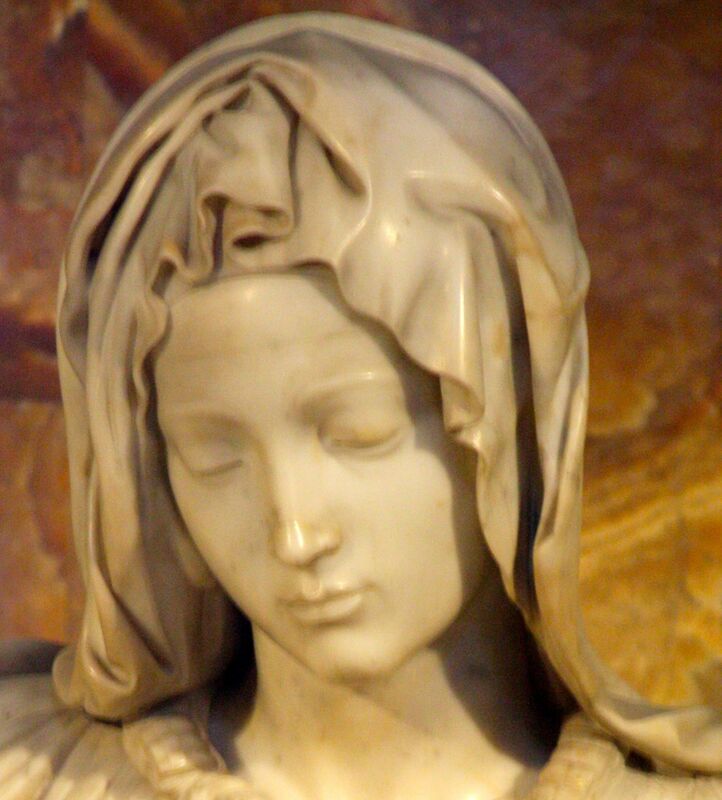 In heaven, I imagine Michelangelo’s marble statue showing Mary’s joy at seeing her risen Savior. After Jesus ascended to heaven, we see Mary in the Upper Room praying and fellowshipping with Jesus’ followers. This woman walked with God authentically. She had studied the Scriptures and trusted God with all that seemed contrary to the world’s wisdom. God called her to a hard life, but a life that made an eternal difference. Maybe you’re going through struggles today. You’re sick. You have financial troubles. You have marital problems. You have family challenges. Like Mary, you may be wondering what God is doing. You may even be mad at God. Every person God calls, He calls to depend upon Him. Like the grapes, we need to abide in Him, abide in His Word, and let Him lead us by the right hand, just as Mary let God lead her by her right hand. You are a child of God, a joint heir with Jesus. You are God’s beloved, and He has plans for you. Plans that are good. Plans that will complete you, so that you are free to recognize that in Jesus, you live, and move, and have your being. In Jesus, you walk in delight of His creation, His kingdom, His people, and His temple which is your body. In Him, you have power, and you have freedom. Sometimes, it’s hard; it’s always an adventure filled with the joy set before you. Father of Hope, Thank You for Mary’s very real and precious walk with You. Thank You for Jesus’ walk. We have much to learn. Lead us by the right hand as the Holy Spirit teaches us from Your Word and directs us through the walk You have prepared for us to walk. Help us to surrender our minds, our strength, our bodies, and our spirits to You. We love You, Lord and praise Your Name. Jesus, You gave all, so that we could live in unity with You. In You, we live and move and have our being. Make us sensitive to Your presence in us. In Your precious Name we pray. Amen. To learn more, download a month’s study guide on the Authentic Christian Woman’s Walk. Keith and I just returned from Rome. The Pieta is my favorite piece of art. While tourists are pointing and snapping photos, I work my way through the crowd to stand next to the barrier that separates us from Michelangelo’s meditation in marble. Each year that I’ve returned, I’ve cried or I’ve hugged another woman who could not control the tears. Mary’s grief became our grief. I wonder if she was thinking about Gabriel’s proclamation about her son, the One who would be the Son of the Most High, Jesus who would reign on David’s throne. From a mother’s eyes, I saw a woman who had experienced everything miraculous about her Son, her Savior, her Lord … from His birth, to the turning of water into wine, from raising the dead, to healing the lepers, restoring sight to the blind and song to the deaf. This was the Man who was slated to save Israel. In her lap was her Messiah. Here was all her hope, all her love, all her dreams. Beaten beyond recognition. Dead. You and I are sinners. The cost of our sin is death – complete separation from our Holy God. Jesus paid the cost of our sin by living a perfect life and dying in our place – the perfect sacrifice. Jesus’ death on the cross cleansed us from our sins and made it possible to live forever with Him – if we become His followers. Jesus rose from the dead, conquering death. Jesus now sits in heaven at the right hand of God speaking on our behalf when Satan accuses us of sin. Jesus loves me. Jesus loves you. Father, thank You for Jesus. Thank You for giving Jesus to the world as our Savior. I pray that You will fill readers with a deeper knowledge and appreciation of Your sacrifice and bring those who do not know You to a saving belief in Jesus. I love You, Lord. What emotion is filling you this Christmas? Now in those days a decree went out from Caesar Augustus, that a census be taken of all the inhabited earth. 2 This was the first census taken while Quirinius was governor of Syria. 3 And everyone was on his way to register for the census, each to his own city. 4 Joseph also went up from Galilee, from the city of Nazareth, to Judea, to the city of David which is called Bethlehem, because he was of the house and family of David, 5 in order to register along with Mary, who was engaged to him, and was with child. 6 While they were there, the days were completed for her to give birth. 7 And she gave birth to her firstborn son; and she wrapped Him in cloths, and laid Him in amanger, because there was no room for them in the inn. Father, thank You for entering the world through a poor young woman who was obedient to Your will. Thank You for emptying Yourself of Your glory and eternity for a time to become a baby. Thank You for sending the first news of Your arrival on earth to shepherds and filling them with wonder and boldness to spread the word about what had happened. Bless us with the joy and wonder that filled the shepherds that night and embolden us to proclaim Your praises and sing, Joy to the World! What emotion fills your heart at Christmas? Patience, Pluck, and Perseverance … the mantra of Mama, and my guiding path as I walked, ran, skipped, stumbled, and climbed through my childhood, teenage years, and early adult years. Later, I came to understand the wisdom in those words, and without realizing it, I adopted the concepts … just gave them different words: wait for the Lord, possess His promises, walk in His power. I know that there were times when Mama’s heart was pierced through when we were growing up, either by things we did or by things we experienced. Yet, as Mary, she stood by her children and served them. Patience, pluck, and perseverance. I’m remembering the many afternoons that she sat with me in the hospital and the times that she sat with my brother in a small hospital in Weleetka, Oklahoma. I’m remembering how she cared for Daddy in all his illnesses. The concept of those words carried Keith and me in the trials, walked us through the challenges, and pushed us towards the mountaintops. Patience, pluck, and perseverance … Waiting, possessing, and walking, step-by-step through the crooked, uphill, downhill, sometimes overgrown path that Keith and I have chosen as our life journey. Majestic Father, You have blessed us with mothers who have shown unconditional love to their families, neighbors, and communities. Thank you for our mothers. May we bless them and show them how much we love them. Amen. May this day remind you of the many way that you have been blessed by your mother and the patience, pluck, and perseverance that your mother has shown in her service to her family and community. Won’t you tell your mother that you love her today?